One remote, endless lighting possibilities. 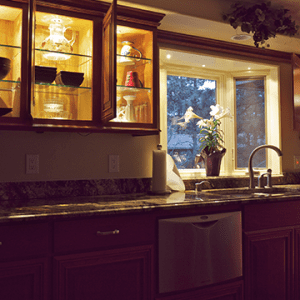 What makes your home special is that it’s one-of-a-kind, why should your lighting be any different? Here at DEKOR® lighting we’ve found a way to make your home even more special with our EZ Motion Controller+ with PIR sensor technology, giving you motion activated pathway lights, motion sensor landscape lights, and beyond. 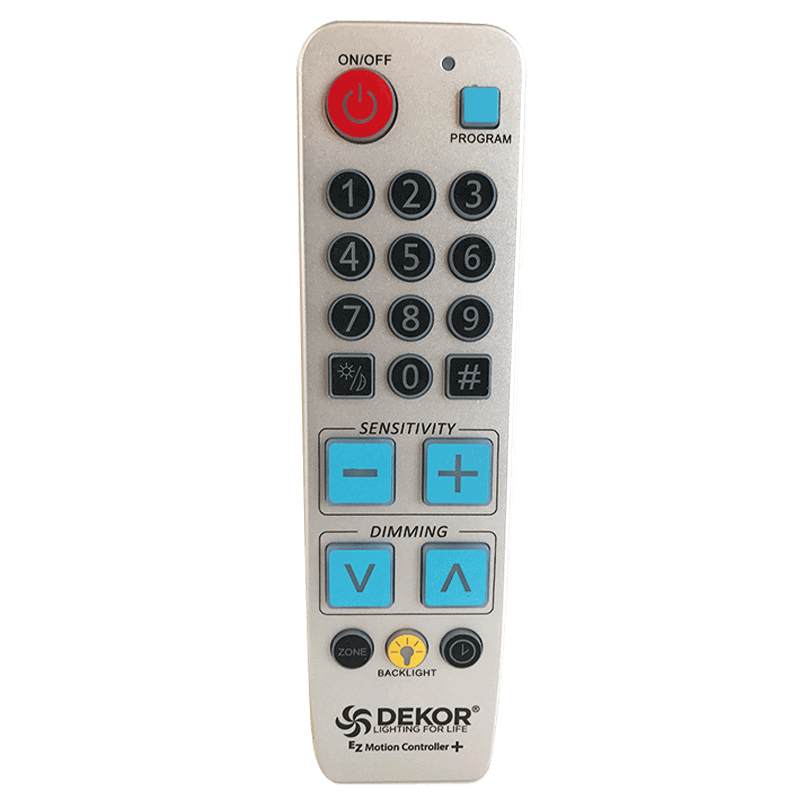 Using cutting-edge Passive Infrared Sensors, or PIR sensors, the EZ Motion Controller+ allows you to customize your DEKOR® LED lighting settings the way you see fit. By giving you the security of our motion sensor light switch with the easy installation of Plug-N-Play™ technology, virtually every DEKOR® lighting product transforms into cutting-edge motion sensor lights in minutes. 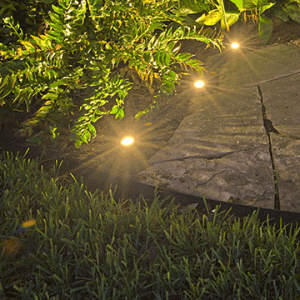 Create illuminating motion activated pathway lights that light the way without breaking the bank, or add motion sensor landscape lights throughout your yard to conserve energy and add lasting shine. With the EZ Motion sensor light switch, the choice is in your hands. The EZ Motion Controller+ and PIR sensor lets you choose the illumination settings of your motion sensor lights, no matter where they’re located in your home. Whether it’s indoor or outdoor motion sensor lights, our handheld remote has an option that’s right for you. With dusk-to-dawn settings, motion-sensing capabilities, zone programming, and a timer, you can shift your lighting from space-to-space. Plus, the sensitivity and dimming controls allow you to adjust the strength of both the PIR motion sensor and Cree LEDs, making it easy to conserve light and energy. And best of all, you can program up to 9 PIR sensors to 1 remote, letting you have 9 individual zones of shine in your home—each with their own lighting setup. 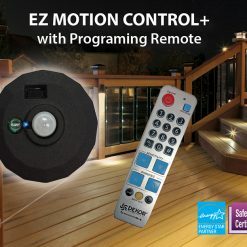 The EZ Motion Controller is so much more than just a remote control for your lighting. It’s a safety blanket around your home, which allows you to rest easy knowing you’re alert and secure from unknown threats. It’s a priceless discount off all of your electric bills for life, cutting down your bills with the energy-saving power of Cree LEDs and your PIR motion sensor. 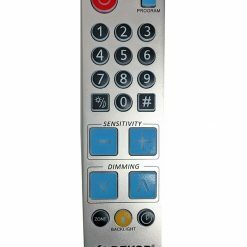 It’s a stress-reliever and life simplifier, giving you the ease of lighting control right from your couch. It gives you not only motion sensor lights, but the freedom to make them your own. 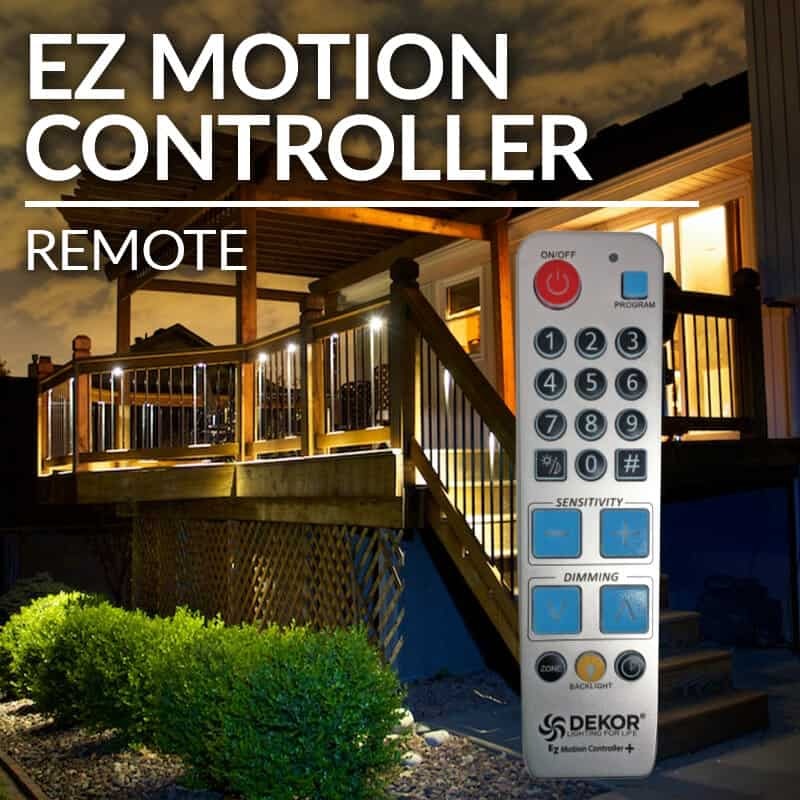 With DEKOR®’s EZ Motion Controller, you can do it all. 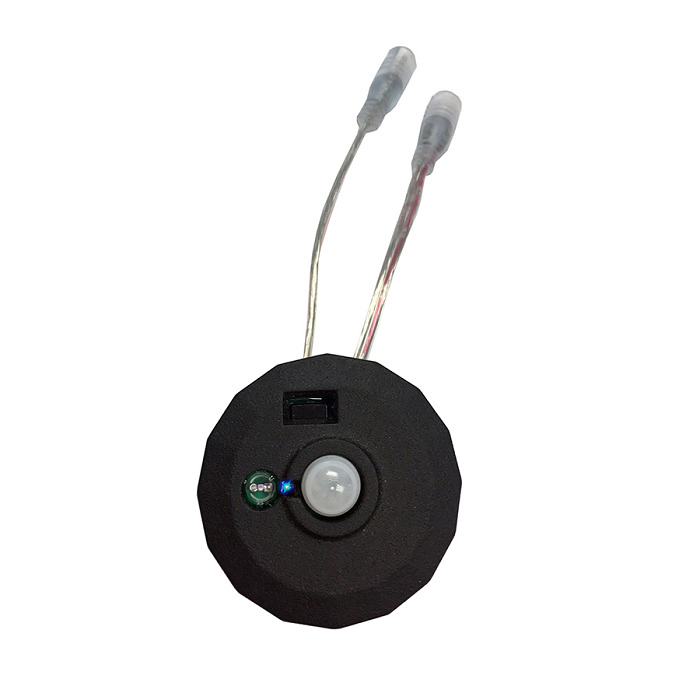 Zone programming: With zoning capabilities, you could potentially connect 9 separate PIR sensors to 1 EZ Motion Controller+ remote, allowing you to have 9 designated and distinct lighting areas, or zones. Using this simplified option, you can design your motion sensor lights to differ from zone to zone. For example, you could have motion activated pathway lights with dusk-to-dawn settings, motion sensor landscape lights with timer and dimming capabilities, and kitchen lights with perceptive PIR motion sensor light switch settings—all from a single remote. Sensitivity controls: When it comes to motion sensor lights, you should have options. Every home has a different level of activity, and with that, a different level of motion. Because of this, we’ve added sensitivity controls to our remote, making it simple to find the motion sensitivity of your PIR sensor that’s right for you. This feature comes in handy if you’re a pet owner, letting you choose to either ignore or detect a pet’s presence so your DEKOR® outdoor motion sensor lights will act accordingly. And if you’re looking for added security, you can easily increase the sensitivity of your outdoor motion sensor lights surrounding your home to stay aware of any unknown activity, keeping your family safe and protected. Dimming controls: Adjustable dimming controls put you in charge of your lighting, letting you increase or decrease the brightness of your Cree LEDs. With our innovative zone programming options, the brightness of your motion sensor lights can vary by zone, making it even easier to live comfortably. For example, if you want to create a cozy atmosphere in your living room, you can dim that specific zone of DEKOR® lighting to evoke a sense of rest and relaxation after a long day’s work. Classic timer: EZ Motion Controller+ and its motion sensor light switch can be set up to activate your lighting at timed intervals. You can adjust your motion sensor lights to turn on every 2-10 hours, letting you fine-tune your DEKOR® LEDs to your liking. This setting is ideal if you have a packed schedule and no time to spare, letting your lights stay consistent and simple while life is anything but. Dusk-to-dawn: Using PhotoCell technology, DEKOR®’s outdoor motion sensor light switch detects the sun’s heat and activate once it sets. In the morning, the PhotoCell senses the sun’s rays again and the outdoor motion sensor lights switch off. This setting eliminates the stress of remembering to schedule your lighting between work, school, and running errands, keeping your home beautifully lit for all the nights to come. If you want to accentuate your home with a stunning shine that adds ambiance, warmth, and refinement, the EZ Motion Controller and PIR sensor isn’t just a lighting accessory, it’s a lighting necessity. To create a dimensional lighting experience without a painstaking programming process, the EZ Motion sensor light switch was designed to make your life simpler. With a quick connection between your EZ transformer and DEKOR® lights, the PIR sensor is ready to shine. The EZ Motion Controller pairs perfectly with our integrated collection of Under Cabinet Lighting, Indoor Stair Lighting, and beyond. Helping you save valued money and energy, the perceptive PIR motion sensor detects your activity, coming to life as you walk in the room. And, the intuitive motion sensor light switch is fine-tuned to detect subtle movements as well, keeping your room illuminated while you’re in it so you’re not left in the dark. The brilliant power of Cree LEDs is one-of-a-kind, providing a stunning shine without spiking your electric bills. But sometimes the sparkle of our LEDs can be too striking for your preferences, which is where the dimming controls of the motion sensor lights come in. Allowing you to dim and brighten your indoor motion sensor lights to your ideal shine, you can add a subtle glow to your living room without becoming blinding. And in dark spaces like your closet where there’s no such thing as too much shine, amp up the brightness of your motion sensor lights to help guide your way through the dark. DEKOR®’s PIR motion sensor makes your home more safe, energy-efficient, and cost-effective, inside and out. Designed to be completely programmable, the 360º range of the PIR sensor packs greater light sensitivity and motion detection than the products of the past. With a colossal range of detection and state-of-the-art technology, this cutting-edge creation is compact in size, measuring only ½” x 1 ¾” in diameter, and powder coated in an antique metal black aluminum case. And, if you’re so in love with the power of our PIR sensor that you want to integrate motion sensor lights throughout your entire home, simply purchase additional PIR sensors to create distinct and designated lighting zones. 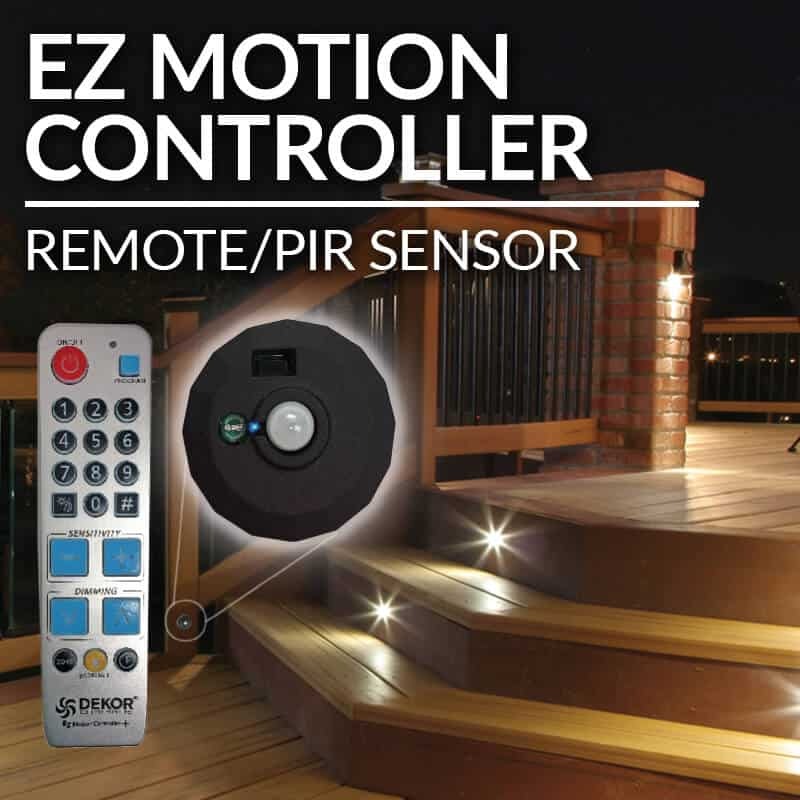 With the EZ motion controller, you can connect up to 9 PIR sensors to a single controller, allowing you to add intuitive illumination throughout every space, room, and section of your home with ease. With the perceptive power of our PIR sensor on your side, you can enjoy the stunning shine of DEKOR® with no fuss, stress, or maintenance. To create the ultimate outdoor scene for all to admire and enjoy, choose the EZ Motion sensor light switch for your next backyard project. Providing much needed visibility and security to your porch, driveway, garage, landscape, pathways, deck, and beyond, discover the innovative power of outdoor motion sensor lights without a troublesome setup. With DEKOR® outdoor motion sensor lights surrounding your home, you can take a sigh of relief knowing your family is protected from unknown threats or danger. If you live in an area that’s prevalently affected by wildlife sightings, the PIR sensor will alert you of such commotion to keep your beloved pets, children, and loved ones safe inside. Or, if your neighborhood is commonly distressed by reckless or dangerous intruders, you can stay in-the-know with our outdoor motion sensor lights, making sure you’re alert and aware no matter what. It’s your home, it’s time you take back control. 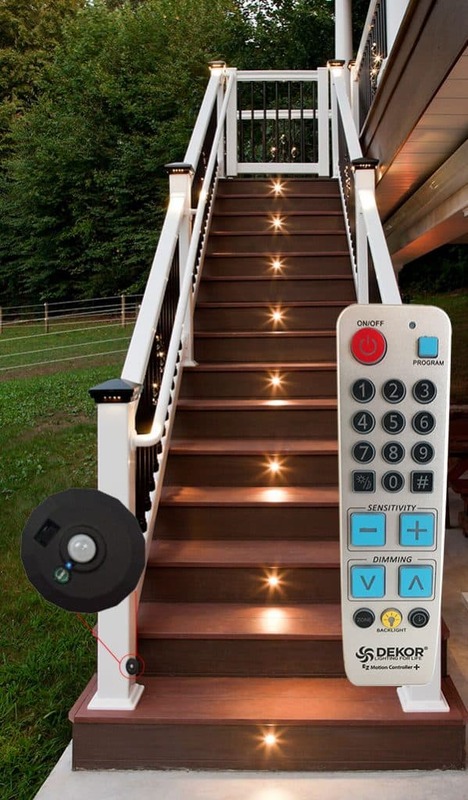 Integrate the endless value of the EZ Motion sensor light switch with your favorite DEKOR® outdoor lighting products, from our best-selling Deck Dots to our stress-free EZ EDGE LITES™ to our recessed stair lighting, and the list goes on. Designed to accompany every DEKOR® product ever made, the motion sensor light possibilities are truly endless. 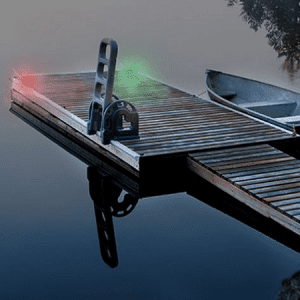 To create motion activated pathway lights that pave the way to increased ambiance, visibility, and energy efficiency, integrate the EZ Motion sensor light switch and PIR sensor with your beloved LED pathway lights. 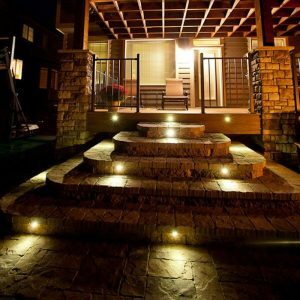 For example, transform the effortlessly embedded EZ EDGE LITE™ into motion activated pathway lights that shine as you stroll along, creating an enchanting illumination while saving valued money and energy. With the EZ Motion and PIR sensor, you can evolve your lighting into motion activated pathway lights in minutes. 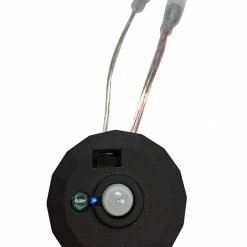 Simply connect the PIR sensor between the EZ transformer and your outdoor lighting to quickly create motion activated lights before your very eyes. The EZ Motion sensor light switch can be used to create motion sensor landscape lights that activate your LEDs when movement or darkness is detected, helping you save valued time and money scheduling your lighting. 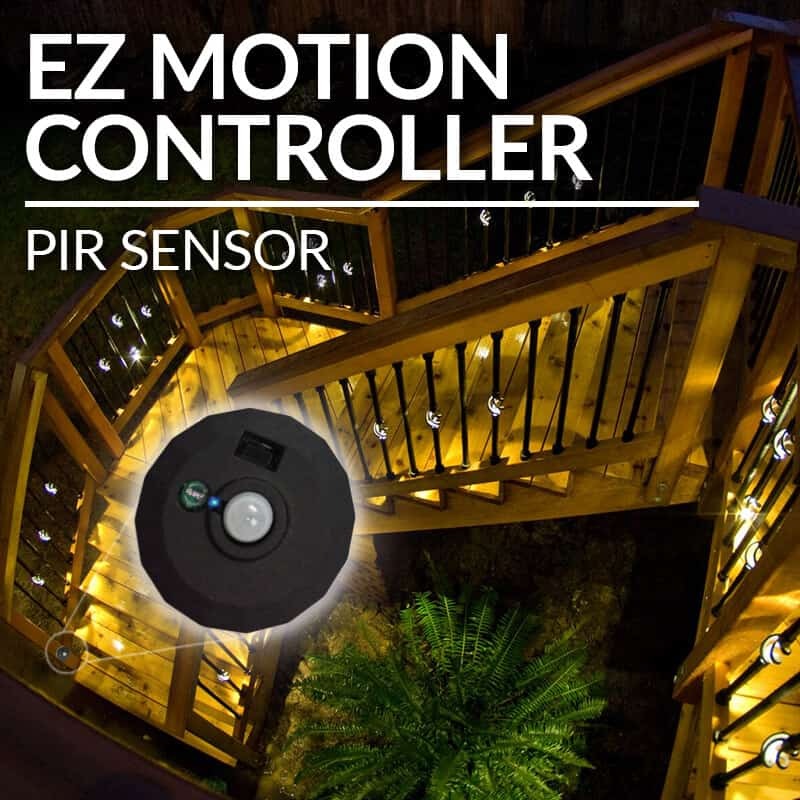 With the EZ Motion Controller, you can create integrated lighting zones throughout your yard by purchasing additional PIR sensors, allowing you to fine-tune each section of your motion sensor landscape lights to your liking. Create a warm, soft glow for your DEKOR® Ambiance LED garden lights with the EZ motion sensor light switch, creating lasting dimension and shine for all to see. 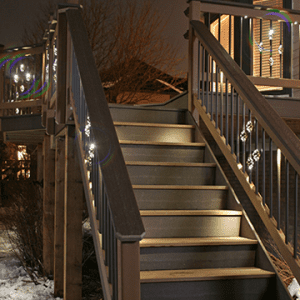 Or, set a schedule for your Deck Dots motion sensor landscape lights on your deck, only shining when the sun is set to help conserve money, maintenance, and energy. With the EZ Motion Controller and PIR sensor as part of your lighting lineup, the possibilities are only limited by your imagination. And, like all DEKOR® Lighting products, you’re protected from failures or shortcomings in the performance of your EZ Motion Controller and PIR sensor. 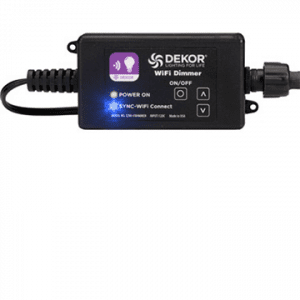 When used with a DEKOR® brand transformer, your motion sensor and controller is protected for 1 year from errors or flaws in workmanship. And, the sleek powder coating finish that encases the PIR technology is protected for a whopping 30 years, keeping your DEKOR® products safe and shining for years to come. Learn more about our unwavering warranty promise below.